Clean and salt the cavity of six whole squabs. Cure overnight in a shallow pan with salt and maple syrup. Cook lentils, crushed garlic and 1 bunch thyme in 24 ounces of chicken stock until tender. Strain and chill under refrigeration. Cut the ends off of roma tomatoes, cut in half and stand upright. Stuff tomatoes with slivered garlic and season to taste. Roast to caramelize at 350° on a sheet pan. Remove, chill and chop. Cut leeks lengthwise and braise in remaining stock, wine and thyme for 25 minutes. Reserve liquid. Oven sear squab at 400° until skin is crisp. Remove breasts. Toss lentils, leeks and tomatoes in reserved liquid over moderate heat. Add arugula, radicchio and sherry vinegar. 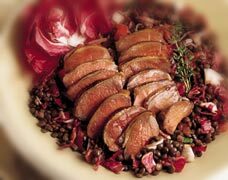 Pour broth over a bed of lentils and top with squab breast. Garnish bowl with thyme.